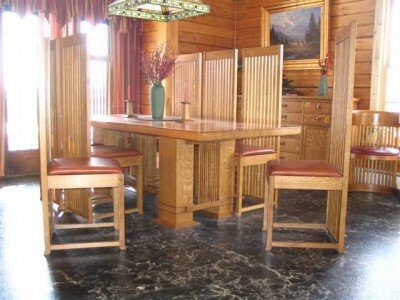 A Dining set done in the FLW style using quarter sawn white oak. 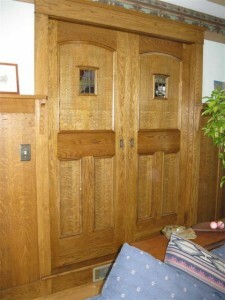 Mission style pocket doors in quarter sawn white oak w/leaded glass windows. Call John for more information if you need custom doors for your home or office. These cabinets, done in white oak with adjustable shelves, are on both sides of a fireplace. 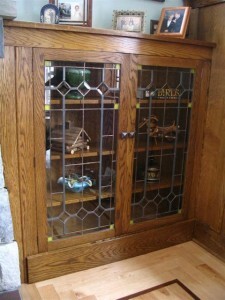 Call John if you need any type of custom cabinets, built-ins or freestanding. At Custom Furniture and Fabrication we love Kitchens. Custom Kitchens, Craftsmen Kitchens, White Oak Kitchens and more. We veneer our own end panels for a perfect look. We manufacture our own doors in house for precise sizing. Call us for your free kitchen quote. We have the experience with custom millwork, we can manufacture just about any wood part you may need. From custom wood legs to custom moldings and decorative wood pieces. Custom Furniture is what we do. We have build hundreds of pieces of custom furniture from sketch to finishing we handle it all! Take a minute to listem to Custom Furniture and Fab's recent radio ad. We have build hundreds of pieces of furniture. We dont have pictures of every project but we have a good selection posted here. Check out our page now! © 2019 Custom Furniture and Fabrication All Rights Reserved.